The Campaign for Treaty Compliance is about getting individuals, businesses, faith communities, schools, organizations, cities and states to be in ‘compliance’ with the Nuclear Ban Treaty. This will put pressure on the nuclear weapons industry and eventually force the federal government to implement the Treaty. * You are not employed by any of the companies that make nuclear weapons. * You do not have personal investments in any of them. * You will not buy any of their products in future . . .
Any organization or institution that wants to be on the right side of history and help rid the world of nuclear weapons can decide to be in ‘compliance’ with the Nuclear Ban Treaty. To have the force of legality behind it, normally it will be the board or trustees or some similar body who will need to agree to this. That body may then oversee the rest of the process or assign a smaller (sub-)committee to do so. . . . There are 220 towns, cities, counties and Native American nations across the United States which declared themselves Nuclear Free Zones (NFZs) in the 1980s. Some of the local ordinances and city codes that established these zones were largely symbolic, but many had real teeth and included fines and other sanctions for violations. Sample ordinances and city codes are located here. Many of these existing NFZs are already Treaty Compliant with the Nuclear Ban Treaty. Others may want to revise their existing legislation to be fully in compliance with the new Treaty. In addition to NFZs, there are 211 cities in the United States who have signed the Mayors for Peace (MfP) covenant. This commits the mayor to “make every effort…to achieve the total abolition of nuclear weapons…” These mayors may choose to appoint a Mayoral Commission to oversee Treaty Compliance for their city. . . . Individual states of the Union cannot sign international agreements, but they can decide to comply with such agreements. When President Trump announced he would be pulling the United States out of the Paris Climate Agreement, cities and states across the country stepped up to the plate to commit themselves to this Agreement, with or without the federal government’s blessing. Sixteen states (plus Puerto Rico) have so far committed themselves to meeting these targets because they recognize that climate change poses an existential threat to humanity and that the US government is out of step with the global consensus on what to do to address this problem. 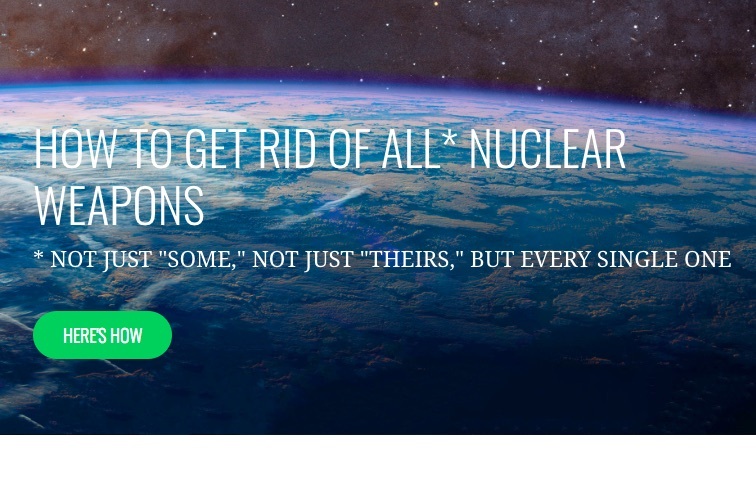 Nuclear weapons also pose an existential threat to humanity, and once again the US government is out of step with the global consensus on how to eliminate these weapons once and for all. . . . The only protection from nuclear weapons is to eliminate them all. The Treaty on the Prohibition of Nuclear Weapons bans all nuclear weapons and seeks their total elimination. Ultimately, we want the US President to sign this Treaty, we want the Senate to ratify it, and we want to see it fully implemented and enforced. You can sign the WILPF petition calling for this here. You can also urge your member of Congress to sign the ICAN Parliamentary Pledge here. . . .